Travelling is now more and more accessible to the people all over the world and the business of travel is no longer limited to the elite. 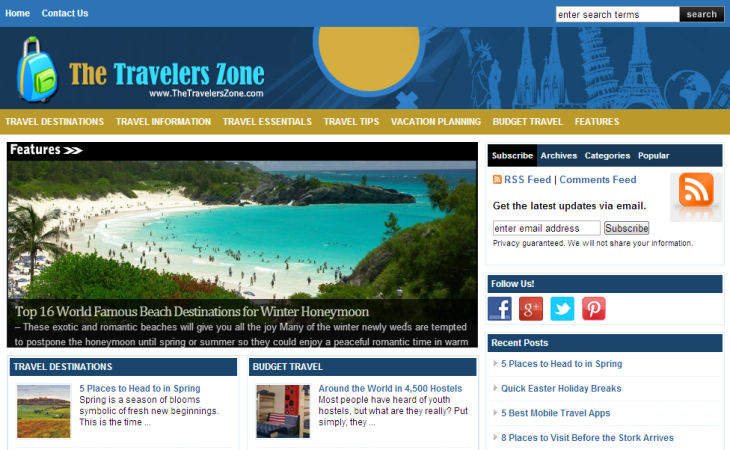 thetravelerszone.com was launched to fulfill the information needs of this growing segment of unseasoned travelers. The site is a complete guide to the world of travelling and the latest destinations across the globe. It documents the most travelled destinations and the least known destinations too. Information is available to the luxury traveler and the budget traveler alike. The site also covers tips for a variety of travelers – business travelers to vacationers. The site also has special articles that carry information on family and kid- friendly destinations.